Although he’s just now on the threshold of turning 40 years old, Matt Schofield has already been playing the blues for more than half his life. The Manchester, England born guitarist, singer, songwriter, producer and bandleader first climbed on stage in front of the general public at the tender age of 13 and has been solely focused on doing one thing ever since. And even though the road he’s traveled has not been paved with gold bricks, it’s a road he still chooses to navigate up and down. 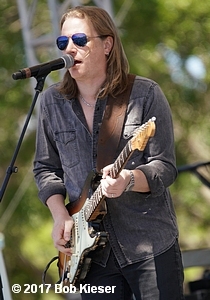 While he’s still been playing some select shows – and attending events like the annual Blues Foundation’s Blues Music Awards (BMAs) in Memphis – the past several months, the lion’s share of Schofield’s energy and efforts have been recently focused on the business end of the spectrum. The new record that Schofield is currently penning material for is a follow-up to his well-received 2014 release, Far As I Can See (Mascot Label Group). Some artists can’t seem to keep themselves from writing new songs and working on material on a daily basis, whether they have a new album looming on the horizon, or not. And some artists are content to wait until a new project is set to begin before authoring the songs that will make up that new collection. Consider Schofield to be a member of the later camp. Some of Schofield’s songs are based on things or experiences that he encounters while going about his daily routine and some of Schofield’s songs are more fictional, more story-like with a narrative that he makes up himself. Regardless of whether his songs are about love gone wrong or about what lies on the other end of the cosmos, the one constant thread running through a Matt Schofield album is a whole bunch of mind-blowing guitar work. He’s capable of shredding – which he does on occasion – but the real beauty of Schofield’s guitar playing is it’s tastefulness. From breath-taking to mournful and on to soulful, Scofield’s voice on the guitar is utterly unique. 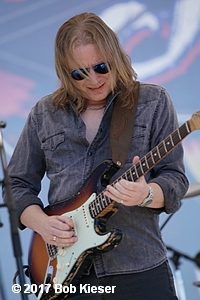 There’s no doubt that he’s a blues player extraordinaire, but his playing favors the Robben Ford end of the rainbow more than it does the Bob Margolin side, although he’s certainly comfortable in either camp . It’s bluesy, it’s funky and it’s jazzy … and at the end of the day, it’s all Matt Schofield. The way Schofield sees it, if your own personality doesn’t shine through in your own guitar playing, than perhaps your time would be best suited doing something else. One signpost of how you are viewed as a guitar player is when you have your very own name stamped onto a piece of gear. That can be a lofty perch to reach and in Scofield’s case, he’s reached it more than once. Not only does he have a signature line of guitar strings (Curt Mangan Strings; www.curtmangan.com), he’s also got a signature amplifier (the Two-Rock Matt Schofield 50; www.two-rock.com) and signature overdrive pedal (Free The Tone MS SOV MS-2V; www.freethetone.com). These are not simply just product endorsements for Schofield. He really believes in and uses this gear on a nightly basis. So well regraded is Schofield’s guitar playing that he is a member of the British Blues Awards’ Hall of Fame. While he is rightfully proud to be recognized as such, Schofield doesn’t believe that that is the be-all, end-all and that it’s now OK to just coast throughout the rest of his career and rest on such accolades. Especially with so much music for the 39-year-old still left to play. Schofield has been busily trying to carve out inroads and build his fan base in the United States after having already successfully making a name for himself throughout the United Kingdom and most of Europe. His plan on breaking through in the U.S. market centers around a simple – yet tough – concept; take things state-by-state. In addition to being a dynamite guitarist, Schofield is also an accomplished producer and helped give birth to several of Ian Siegal’s records in the mid-2000s, including standout albums like Meat & Potatoes, Swagger and Broadside (Nugene Records). Much like Schofield, Siegal is an extremely-gifted British blues artist that really hasn’t captured all the acclaim that he’s due from the this side of the pond. While he may consider himself a ‘guitar player that sings,’ Schofield is nevertheless a highly-competent vocalist and is clearly becoming more confident in his own abilities with each album that he issues. Another of Schofield’s heroes on the guitar – Eric Clapton – also kind of developed his own vocal style as he progressed through the early part of his career. If an artist is looking to strike gold and get rich quick in the entertainment industry, playing the blues is the first thing to avoid. That’s pretty much how it was 50 years ago and that’s pretty much how it is today. 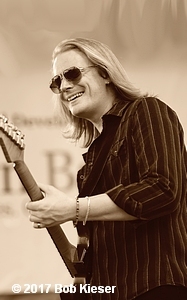 However, Schofield says there are examples of those that have managed to do pretty well for themselves in this new millennium, chief among those being Joe Bonamassa.